Symptoms of skin cancers that develop on the eyelid include: A bump that is smooth, shiny, pearly or waxy, or firm and red. A sore or lump that bleeds or develops a crust or a scab. Most eyelid skin cancers are removed by a specialized dermatologist called a Mohs surgeon. Given the complex anatomy of the eyelid, most Mohs surgeons will work with an oculoplastic surgeon to do the repair after the cancer has been removed. A variety of defects of the upper and lower eyelids can be encountered after Mohs surgery. The goals of eyelid reconstruction are to provide structural and functional restoration with an excellent aesthetic result. A thorough knowledge of the intricate anatomy of the eyelids combined with familiarity of the wide variety of reconstructive options is required to achieve these goals. 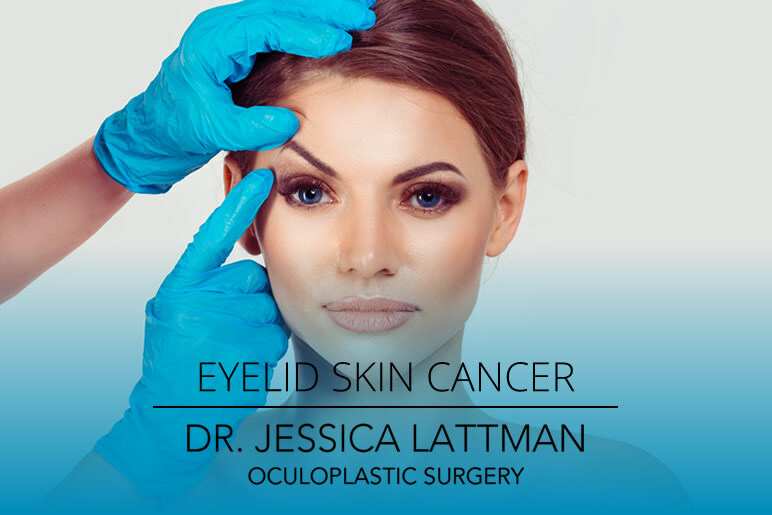 Dr. Lattman has extensive training and experience diagnosing eyelid skin cancer and repairing the defects after Mohs excision. With her specialized training as an oculoplastic surgeon, and 21 years in private practice, she has successfully repaired many complex post-Mohs defects with great success. So if you have a questionable skin lesion on or around your eyelid, see Dr. Lattman to have it properly evaluated.